"Bookshops have an almost universal appeal. What constitutes this appeal is hard to pin down. When you enter an art gallery or an antique shop, you see what you hope will surprise and delight you, but a bookstore does not show what it is selling. The books are like closed clamshells. It is from the collective impression, from the sight of many books wedged together on many shelves, that the mysterious good feeling comes." recently, i read Janet Malcolm's fascinating New Yorker piece on the history and family behind the famed Argosy Bookshop, and it's too good not to share. 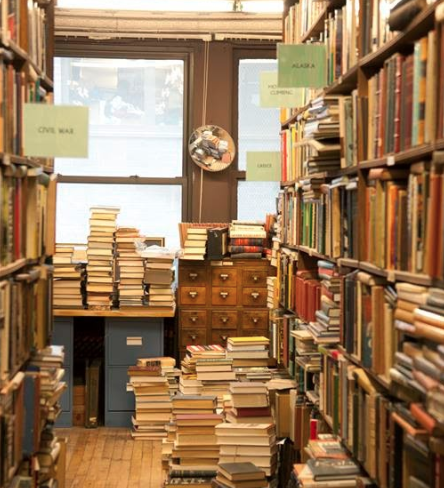 a wonderful bookstore is like a secret door to a Dickensian world. it's a reminder of the importance of switching gears, slowing down, rediscovering one's senses, and the joys of real tactility. is there a special place/space where you go for inspiration? what are you currently reading? Thanks for sharing the article. I shed a little tear for “There are not enough requests for Iris Murdoch,” who is a particular favorite of mine. I'm glad they own the building. I've never been to their store, hopefully next time. i remember discovering Iris Murdoch for the first time years ago, also via the New Yorker. a beautiful writer and incisive thinker. Once again, thanks for the great quote! Finding the "right" bookstore is one of my book shopping "issue" in Paris. I can't seem to find one that sells all the ranges of books I'm interested in - fantasy, contemporary African/diaspora literature to essays not to mention that I prefer reading the original -when in English- version, so I hop from one to another and sadly the big online bookstore starting with an "A" gets a lot of my money in the end because of prices and availability. There is one bookshop that I really like (Shakespeare and Company) which sadly has become some tourists magnets and people spend more time annoyingly taking pictures of the decor -though forbidden- than actually being interested in the books. Right now, I'm reading several borrowed from the library books : Toni Morrison "Home", Jennifer Egan "A visit from the goon squad", Mandela's "Conversations with myself" and bought from an actual bookstore "The subtle knife" by Philip Pullman. Wow wished I went to this place when I was in NYC. There are some nice bookstores in Van, but none with the kind of history and allure as this one.